As travelers, adventurers, and outdoorspeople, we are sometimes unable to enjoy decent showers, warm baths, or hygienic pampering for a couple of days. Just like any other person, we always grab each and every opportunity to wash, clean, and refresh ourselves. However, certain conditions that are unique to the world of travel and adventure can make cleaning ourselves a whole lot more challenging. For example, if a sachet of shampoo leaks in the plastic bag where our toothbrushes are stored, we will be brushing our teeth with shampoo! During overnight voyages on board a ship, the shower room (which sometimes shares a toilet) does not have any space where we can put down our toiletries (would you put your toothbrush on the toilet tank bowl? Yuck!). In many rivers, rough debris sticks on our biodegradable soap if we place the bar in some crevice. Good thing we have a Deuter Wash Bag, our trusted travel companion, to eliminate these problems. For years, our wash bag kept our toiletries and personal stuff neatly organized and stored. If you travel or go adventuring a lot, you should get one. In fact, we recommend having one at home; it saves bathroom space! In its folded/closed position, the sporty Deuter Wash Bag is compact. It can easily fit in your shoulder bag, backpack, or business bag. You can make it more compact by tightening its strap. The small buckle keeps the bag from accidentally unfolding. Despite its compact size, the Deuter Wash Bag is actually spacious. Ours can hold basic toiletries and personal grooming items enough for a family of three or four people. In addition, its advanced Nylon Pocket Rip fabric makes it lightweight. However, the tight weave makes the wash bag resistant to abrasion and tears. 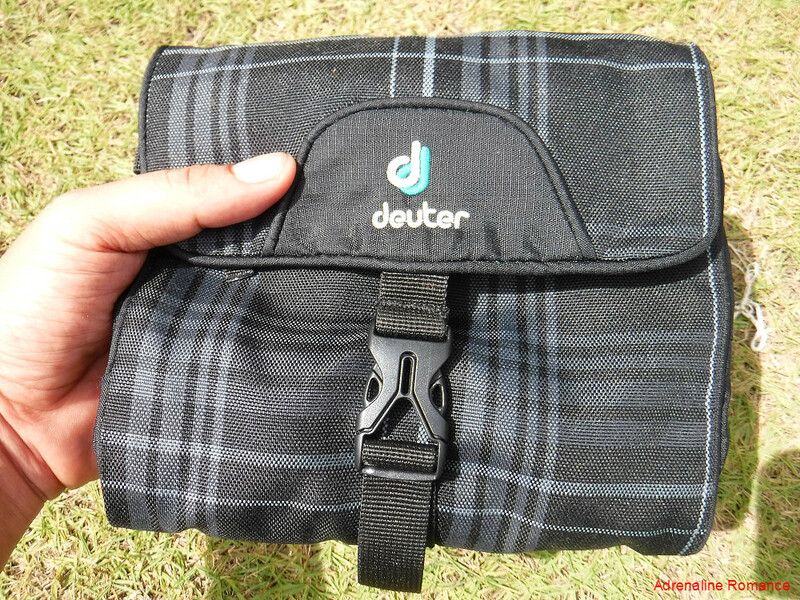 One of the best things that comes along with this Deuter Wash Bag is its extra large hook, which is attached to a multi-directional, rotating joint. The joint is, in turn, attached to the body with a sturdy bar-tacked. Thus, you can hang the wash bag anywhere—showerheads, window frames, crevices, tree branches, etc. 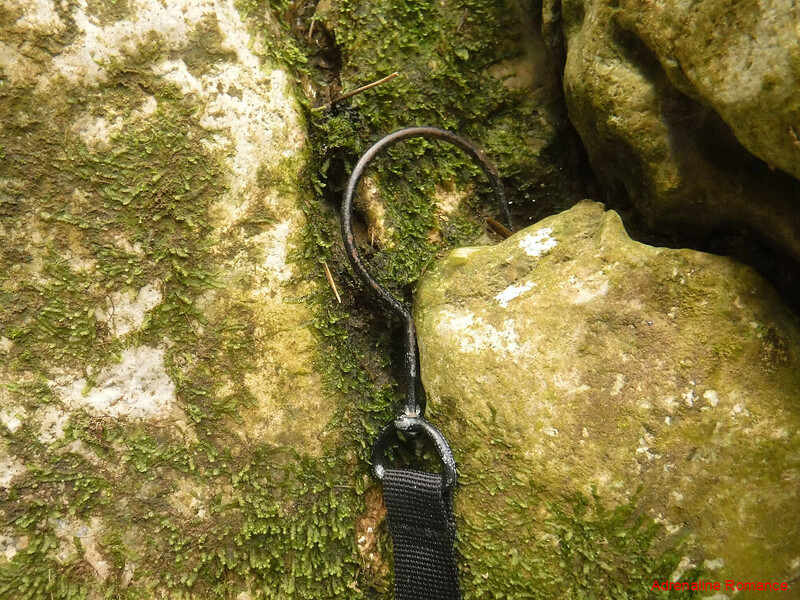 When not in use, the hook can be stowed in its sleeve. 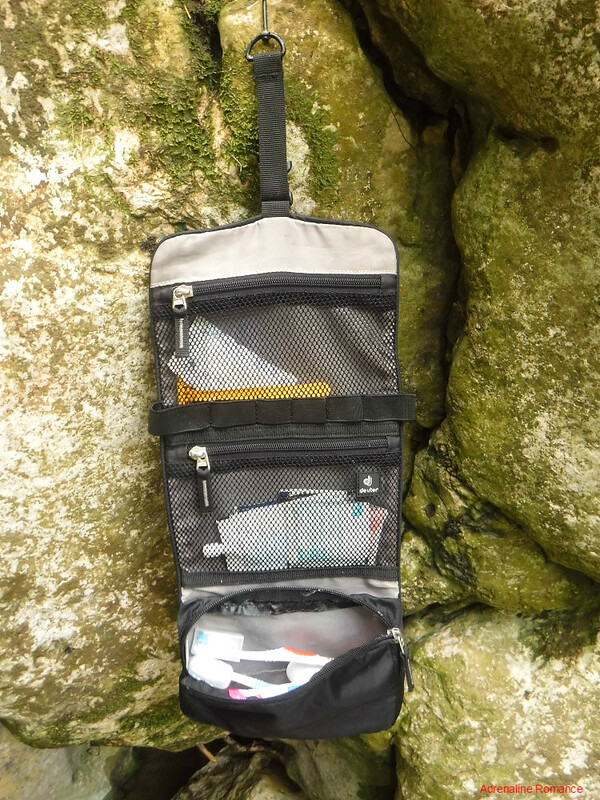 When opened and unfolded, the Deuter Wash Bag has a lot of space for your toiletries. A large zipped pouch securely holds items such as small bottles of shampoo, rubbing alcohol, sunscreen, deodorant, dental floss, and more. Two net pouches hold other quick-to-grab items such as gels of lotion or hairstyling gel, used bars of soap, or a razor. Between the two net pouches are elastic loops where you can insert your toothbrush or safety razor to keep them in place. Tip: Note that the Deuter Wash Bag is not entirely moisture resistant. It may seem to be a disadvantage, but actually, we saw the logic of the design. You see, it would be difficult to rinse or drain out trapped moisture or accidentally spilled contents from inside the bag if the fabric was completely waterproof. Wrap items that seep or can be damaged by moisture (e.g. used bars of soap, wet toothbrushes, used toothpaste or shampoo sachets, flip-top bottles of liquid, wads of tissue paper or wet wipes, etc.) in small plastic bags before putting them in the wash bag. For extra protection, wrap the wash bag in a plastic bag before putting it in your backpack. Deuter Wash Bags come in different sizes and colors so you can pick out the one that best fits your needs and preferences. Whether you are in a posh hotel room, a budget inn, or in the wild outdoors, the Deuter Wash Bag is a perfect travel companion. Thus, you can say goodbye to dropped toothbrushes, spilled shampoo bottles, misplaced shavers, or squeezed-out toothpaste. Get a Deuter Wash Bag now! 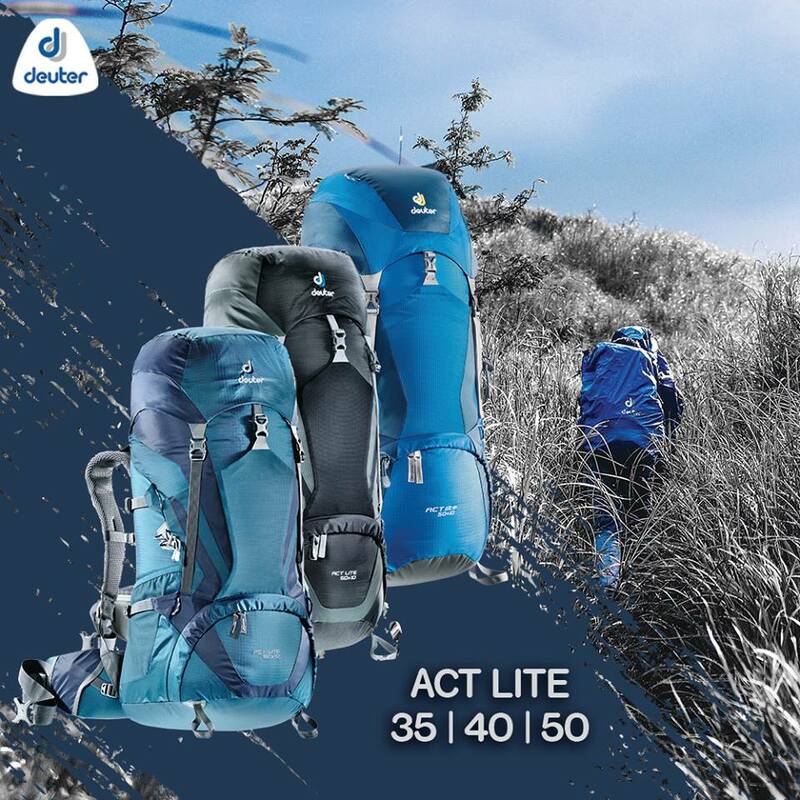 If you are looking for top-quality and reasonably priced travel and outdoor accessories, adventure backpacks, and urban bags, then look no further than Deuter. Deuter products are available at their concept store at the second level of Active Zone, Ayala Center Cebu. They are also distributed nationwide by Chris Sports. For inquiries and details, send a message through the Deuter PH Facebook Page. Had to laugh the number of times my shower gel spilt all over my toothbrush!!! I totally agree with the bag not being too water proof – I always throw mine in the wash once I come home from a trip. This looks like a really useful little bag! I like that it is small but have enough space for everything! That is a good recommendation. I remember I received a bag like that one on my birthday. Your post gave me an idea what to do next to organize my things. This little bag can be of big help. We usually put everything in ziploc bags and then put it in a lined toiletries bag but I can definitely see the appeal of being able to hang up the bag. If you hang it up in an area like a shower where it would get wet, how long does it take to dry? Does the fabric dry quickly or does it hold the moisture? We once tried zip locks too, but the moisture from the used bars of soap, shampoo, etc gets trapped in the plastic. The Deuter Wash Bag dries fairly quickly if you put it in an open-airy space where the moisture evaporates. We love this idea. Thanks for this great tip. We found our selves in many situations that this bag would have helped so much. Seems like a sturdy product and very practical. I love the large hook that makes it hang anywhere. That is the part that will come in so handy when you really need it! Very useful! This bag is highly multifunctional and has all the space you require for your necessary stuffs to carry when you are on the go. I am going to buy this ASAP. Good idea, the bag seems very useful , small but still being able to hold many things for your travels. Thanks for sharing it . This bag is especially practical because of the hook! I, too, have been stuck awkwardly holding multiple toiletries trying to avoid dirty surfaces. I’ve had a wash bag for years and all my friends travel with one! But I never for a second thought about hanging it somewhere outdoors, usually it just stays in the bathroom or in my bag! Yea, definitely strange that most of them are not moisture resistant esp. for the purpose they serve. I always am afraid that things will get wet and then moldy when I’m traveling! 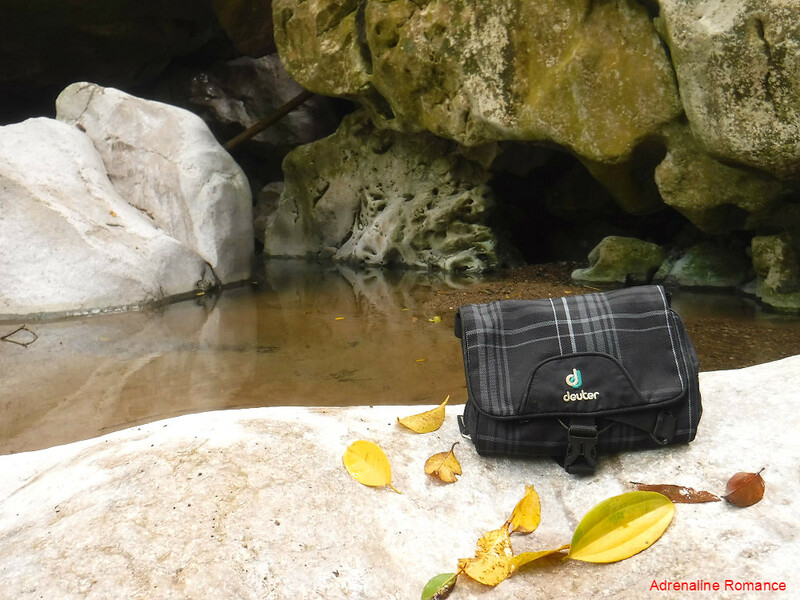 Yup, we bring our wash bag anywhere, indoors or outdoors, when we travel. The non-resistance of moisture has a purpose; it lets the wash bag dry easily. We haven’t had any experience of our wash bag getting moldy. That is cool! We actually have two Deuter wash bags. We use the other one to store some light snacks, MP3 player, headphones, and other small, quick-to-grab items. Just like you, we simply hook it up to a bus’s back seat dangle it front of us for convenience.